Introducing the fruit that is indigenous to Borneo. In Brunei it is called kembayau. 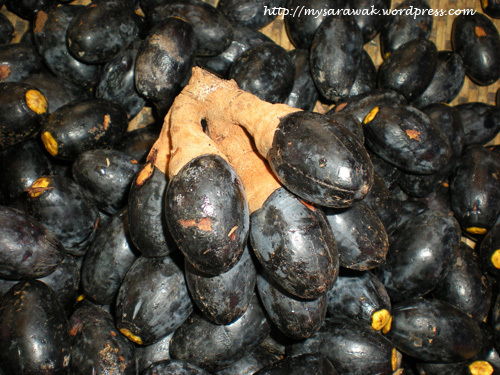 Sarawakians called it buah dabai (dabai fruit). It can be found mainly in Sibu (a.k.a. Sibu “olive”) but like anything that can reap profit this little fruit has made it ways to every markets in Sarawak. It is a seasonal fruit by the way. The way to eat it is first rinse it then soak in lukewarm water until it softens. Season with salt or black soy sauce. The yellowish fresh taste creamy. Actually you can preserve it just by soaking it in a jug with black soy sauce or with coarse salt (without the seed). I believe there are hawkers who sell dabai fried rice also. The second best thing that comes out from one single fruit is the seed. Wash clean and sun dried the triangular seed. Crack it open by using mortar and pestle coz I found that a nut cracker device doesn’t work on this seed… and then you find this lovely, crunchy, greenish nut. If you have problem taking it out from the shell, use a toothpick. Dabai and Kembayau are not the same fruit. Dabai is dabai and Kembayau is kembayau. They are not the same taste. I prefer kembayau then dabai. Make your further research if i’m wrong. 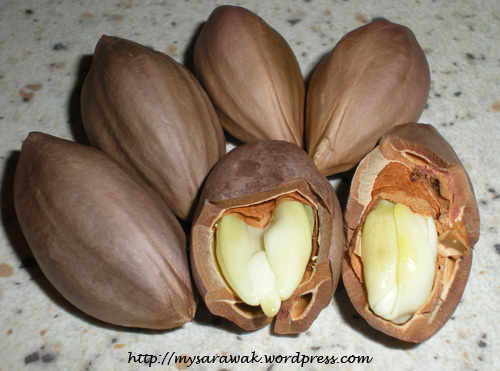 I agree with you there is another species they are look like kembayau but the seeds are different. We called them in Brunei Penanasan. The taste is quite similar but more sticky. My research came from the internet and since kembayau and dabai have the same scientific name canarium odontophyllum, I presume they are the same. Likewise these websites stated they are the same. Oh dear… are they the same or not? I can testify that Dabai and Kembayau are not the same and their taste are also different. You can check out the seeds. One will have a triangular shaped and the other smooth and round in the middle. Furthermore, Dabai has thicker flesh while Kembayau does not. Dabai has a longer shelf life while Kambayau does not. The scientific name may be the same but I am sure the variety is not. This is where the confusion starts. I agree with Andrew that dabai and kembayau are two different fruits. Dabai is quite commonplace in the upper Rejang, especially Kapit area. Kembayau is mostly found in the jungle. Dabai fruits are different in taste and some are more fleshy than the other. Kembayau offer a slightly different taste, a lit bit more sweetish and the skin is harder than that of dabai. No reference needed, as I am a hunter who use to encounter kembayau trees in the jungle. Anyway kembayau is fast becoming scarce because of logging activites. Thanks. can anyone tell me the nutritional value of these fruits? Fruits like dabai (Canarium odontophyllum), kembayau (Dacryodes rostrata f. cuspidata), durian nyekak (Durio kutejensis) and durian kuning (Durio graveolens) are very nutritious with high values for energy, protein and potassium. Dabai (C. odontophyllum) is a species of Canarium which is a delicious and nutritious fruit which tastes something like avocado. The skin and flesh are edible after soaking in warm water. The fruit contains all of protein, fat and carbohydrate, thereby making it an ideal food (most nuts are low in protein). thank you for the info mymalaysia! well, dabai can be preserved for months long. just wash it then dried it up with dry clothes and put it inside any container and put it inside the freezer. when you want to eat it, just take whatever amount you need and thaw it in the bowl until soft and you can eat it like usual. i prefer to soaked it in hot water when it’s soft already as it taste nicer. so far i already kept my dabai for 3 month and it still taste nice. heyyyy… u know guys…dabai is really nice…i dont know about kembayau.And now knowing the technologies from the professional people who are the experties of this fruit, its no more a seasonal fruit. You can eat it all year round by keeping it frozen. Get as many as u can during harvesting time and keep it frozen and when you want to take it just put the frozen fruit in hot boiling water for 5 minutes then you can take it…Just as nice and as good as fresh fruit. increases dabai prices are falling. Can it be marketed overseas frozen? Would you buy Greek or Spanish olives frozen? People from A.R.C.,Kuching told me that they are promoting frozen dabai to keep market prices high. They want to market frozen dabai off season for between 20-40 RM. still could not be sold! really worth, a few ringgit a kg. In the near future dabai production in Sarawak will quickly double or even triple. Who will buy them and for how much? On the other hand,kembayau production is decreasing in the forest because of logging activities. I like kembayau and so far found 4 different kinds: one is the standard one you usually see on the Tamu, the other one is fat like a dabai,then the biggest one from the Ulu Akha region is almost twice the lenght of dabai, they are the size and shape of belimbing asam, and then there are the small varieties 1-1.5 cm only. Yes, i seasoned my dabai with salt too. Though sometimes I used soy sauce. To say it can be found mainly is Sibu is not correct. Go to places in Sr Aman and Betong, you can find a lot of them too. Kemayau and Dabai are different fruits, may look similar. But they tastes different, and their seeds are different too. i’m from semenanjung and looking for dabai/ kembayan (not sure which one yet) for fren to export, but want the seed only, any idea who can i approach? Maybe can try Jabatan Pertanian. See if they can advise you coz as far as I know, not all plants can go to Semenanjung. Hello people.. here is a question im trying to find out… What are its properties in terms of nutritional value? Its creamy like an avocado/ buttery flavour. Its been my favourite fruit. I eat by the kilos and have it only when im back in Sarawak….. Anybody knows?? i hv seen wif my own eyes.. tasted them too..
there are certainly different physically and in taste. i seriously think they are different species. yet. a search in google tells me that they are same species. but kemayau tu ape ? and i m trained in botany….